Discover the possibilities at Camp Jewell YMCA! For over 110 years Camp Jewell YMCA has been helping people develop life skills that prepare them for future success. Our retreat programs are built around your goals. Surrounded by 540 acres of woodland we develop our programs to meet your needs. Our teambuilding participants leave with a springboard to transfer the unity, cooperation, and teamwork experienced during their visit to their lives back home. Best of all, the laughing, playing and working together promote a sense of camaraderie and pride that lasts well beyond the stay at camp. 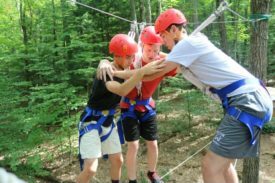 Each year we serve over 20,000 participants in our Outdoor Center programs ranging from college and universities such as the University of Connecticut, Amherst College, Springfield College, to fraternities such as Sigma Phi Epsilon and UConn Greek Life. We serve church groups, youth groups, and many other organizations. Our foodservice staff is happy to accommodate most food allergies and special dietary needs and will work with you to ensure that every participants needs are met. No matter the needs of your group, our entire staff team is focused on ensuring that your stay at camp, no matter how short makes memories that last a lifetime. Come discover the difference that is Camp Jewell! 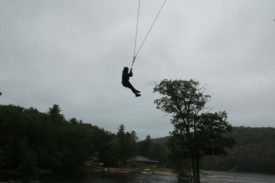 You can choose from a wide selection of recreational and team building programs that are designed to meet YOUR needs. You can customize the program to include as much or as little programming as you need- we focus on building and strengthening communities. Camp Jewell YMCA has many exciting activities all year long! Summer, Spring and Fall activities include horseback riding, swimming, archery, mountain boarding, rock climbing, kayaking, arts and crafts, high ropes, hiking, fishing, soccer and many more! Winter activities include snow tubing, ice skating, snowshoeing, ice fishing, ice golf, broomball, cross-country skiing, candlemaking, arts & crafts, bbs, archery and other fun indoor programs. We even have our own snowmaking system!